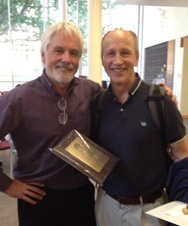 Andy Karplus wins 2012 Gilfillan Award for Distinguished Scholarship in Science. Congratulations to Dr. Andy Karplus who has won the 2012 F.A. Gilfillan Memorial Award for Distinguished Scholarship in Science. The criteria used by the College of Science selection committee is scholarship and scientific accomplishment over a substantial period of time and significant impact on his or her field. Andy joins the ranks of three other BB faculty (Ken Van Holde, Chris Mathews and Joe Beckman) who have won this most prestigious award bestowed by the College of Science.